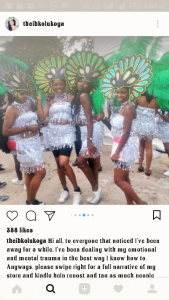 By Sadiq Umar – A 22-year-old lady @theibkolukoya shared on her Instagram how she was sexually assaulted at the the just concluded Lagos State Carnival organised by the Steve Ayorinde led Lagos State Ministry Of Information. She was one of the dancers who performed at the event, she wrote, and after their performance the officials of the carnival laid down excuses on why their payments couldn’t be made on that day. She and the other dancers decided to protest by marching to the stage, and almost there, the crowd scattered, leaving only her. Alone and vulnerable, the audience close to the stage assaulted her, first trying to steal her phone, then ripping her clothes and underwear off her, then penetrating her with their fingers. She cried for help, she said, but a policeman close to the scene only looked on. Another dancer eventually came to her rescue, and she found her way to the paramedics who cleaned her up. Ibukunoluwa is calling for justice. 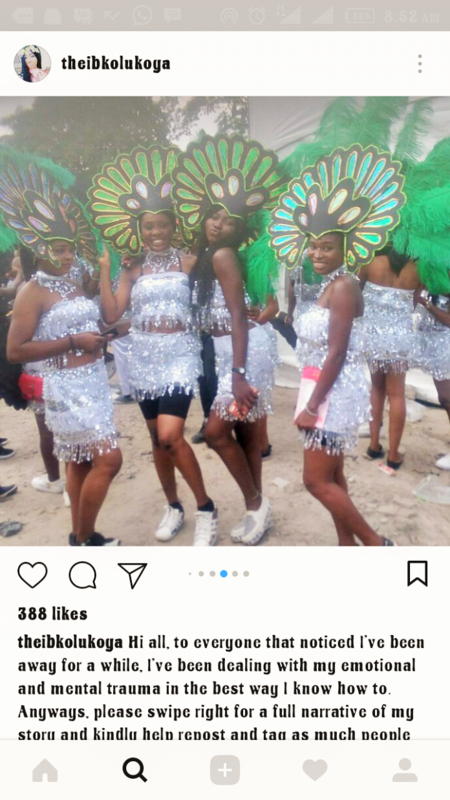 She wants to know why Lagos State allows its officials to treat its entertainers without respect, and why the policeman deserves to wear his uniform.